Lessons in Triathlon: Hey, Coach! Let's meet my coach. I mentioned her in my last post, but here is what you need to know about Joanna Chororowska in order to properly meet her. 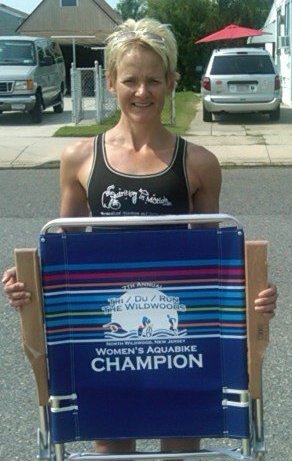 Joanna Chodorowska is founder and principal nutritionist and triathlon coach at Nutrition inMotion and has been a competitive triathlete for more than 17 years, placing regularly in her age group at races. Joanna enjoys training and racing, and now helping others achieve their goals and aspirations in the sport of triathlon. Since no one is the same, she creates personalized nutrition and training plans for each of her clients. Everyone has a different strength and weakness in triathlon, so she develops plans to minimize the weakness and create a new overall strength. Sports nutrition is key to the success of any athlete. She believes if your nutrition does not complement your training, your results can suffer from symptoms like poor recovery, aching muscles, low energy levels and general malaise. Joanna's nutrition plans help the client use real foods for better recovery and overall performance. She helps clients burn fat, not sugars, while training so they reach their optimal racing weight and body composition. To be at your best, you need a solid training plan along with your nutrition plan. Joanna provides these for her clients in a way that they see results without feeling overwhelmed. She provides healthy nutrition and training for everyday living. As you can see, I'm in for the time of my life. I cannot wait to start training with Joanna and I'm even more excited to share our journey with you.